There are mobile apps out there for just about anything you can think of. Whether you want a new way to send Tweets or a high-tech replacement for a whoopee cushion, you should have no trouble finding something you can use on your smartphone or mobile computer. While Microsoft, Android, and Apple have offered these apps for a long time, no one has ever brought them to your desktop computer - at least, not until Windows 8. We'd like to introduce you to the Microsoft Store – also called the Windows Store – a feature of Windows 8 and Windows 10 that allows you to choose from thousands of available apps to use on any of your newer Windows devices. To get started with the Windows Store, click or tap Start and select the Microsoft Store tile. Your Store tile may look different than the one shown in the image above. The image shown on the tile rotates in much the same manner that the pictures tile rotates through the images in your Pictures folder. 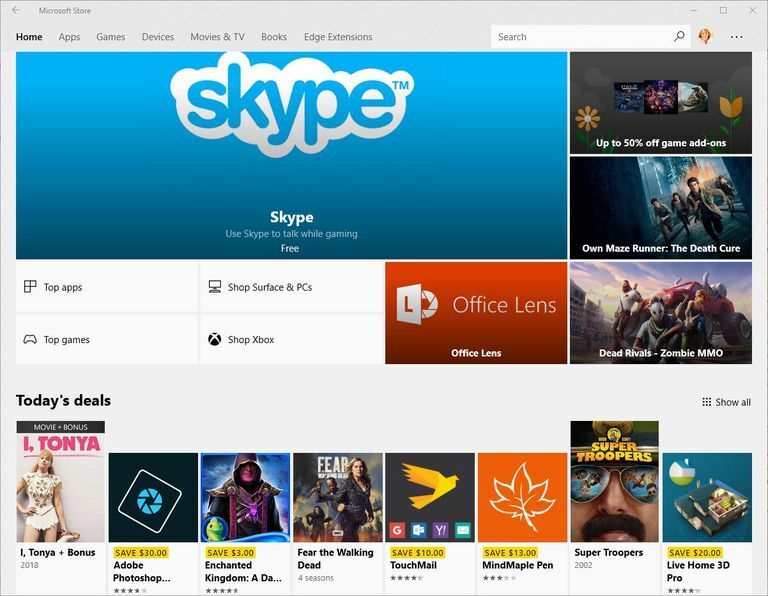 The Store takes advantage of the user interface that was introduced in Windows 8, so you'll notice it's laid out with a visual tile design that makes it clear what apps, games, movies, etc., are available. Although not shown in the picture, you can scroll the Windows Store home page to see additional categories of apps that are available. Games - Includes hit titles like Angry Birds, Fruit Ninja and Jetpack Joyride. Social - Contains apps that keep you in touch, such as Twitter and Skype. Entertainment - Apps that pass the time like Netflix and Hulu Plus. Photo - Photo editing and management apps like Instagram and Adobe Photoshop Elements. Music & Video - Apps for listening and watching like Slacker Radio and Movie Maker Pro. Other - There are many more categories with lots to offer. As you scroll through the categories, you'll find that the Store highlights featured apps from each category with large tiles. To view all of the other titles in a category, click the category title. By default the apps will be sorted by their popularity, to change this, select Show all in the right corner of a category list. You're taken to a page that list all of the apps in that category, and you can select sorting criteria from the drop-down lists at the top of the category page. Bestselling - Lists the best selling apps in the category, whether free or paid. Best-rated - Lists the apps in that category that have the best star ratings, as reviewed by actual app users. Collections - Lists collections of related apps based on the category page you're viewing. Browsing is fun and is a great way to find new apps to try out, but if you've got something specific in mind, there's a faster way to get what you want. Type the name of the app you want into the Search box on the Store's main page. As you type, the search box will auto-suggest apps that match the words you're typing. If you see what you're looking for in the suggestions, you can select it. Otherwise, when you typing, press Enter or tap the magnifying glass in the search bar to view your most pertinent results. Find an app you like? Click or tap its tile to view more information about it. You have top scroll the app's information page to view the Description, see Screenshots and Trailers, and to view what other people who downloaded the app also liked. At the bottom of the page you'll find information about What's new in this version, as well as System Requirements, Features, and Additional information. If you like what you see, click or tap Get to download the app. When the installation is complete, both Windows 8 and Windows 10 will add the app to your Start screen. Once you start using Windows apps, you'll need to make sure you keep updates current to ensure you get the best performance and newest features. The Store will automatically check for updates to your installed apps and alert you if it finds any. If you see a number on the Store's tile, it means you've got updates to download. Launch the Store and click the three dots in the top-right corner of the screen. In the menu that appears, select Downloads and updates. The Downloads and updates screen lists all of your installed apps and the date they were last modified. In this case, modified could mean updated or installed. To check for updates, click Get updates in the upper right corner of the screen. The Windows Store reviews all your apps and downloads any updates that are available. Once downloaded, those updates are automatically applied. While many of these apps are designed for use on a touch-screen mobile device, you'll find that most work great in a desktop environment. Take some time to see what's out there, there's an impressive supply of games and utilities, many of which won't cost you a thing. There may not be as many apps for Windows 8 and Windows 10 as there are for Android or Apple, but there are hundreds of thousands available now (669,000 in 2017, according to Statista) and more are added every day.